Evidence continues to suggest that Apple is deeply interested in bringing 3G communications inside future Macs, particularly the MacBook Air. Let’s look at two pieces of recent evidence to see if a MacBook Air 3G is destined for a future release. AppleInsider is reporting that select MacBook Air 2010 customers have received an interesting survey that includes several questions regarding 3G wireless use and the MacBook Air. 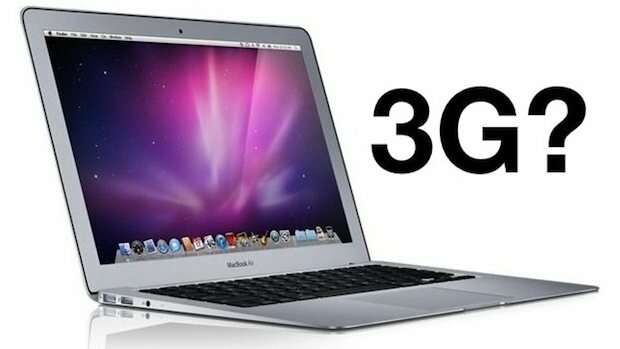 Specific questions include what type of 3G connections are used with the MacBook Air, how often 3G is used with MacBook Air, and what would cause the MacBook Air owner to use 3G instead of WiFi. The idea that 3G communications would come to the Mac line is hardly far fetched. Apple already builds multiple 3G devices, including the iPad and iPhone, why not bring 3G to their portable Mac line? This seems like one of the next logical steps in the MacBook lines feature set. Now for some quick conspiracy theory and opinion here… the patent is obviously telling, but I think what’s more interesting is the customer survey asking MacBook Air owners about 3G use. Apple knows that anything they say or do will be heavily scrutinized, praised, reviewed, dissected, and speculated over. If you were a conspiracy theorist, you could almost view this 3G survey as a controlled leak by Apple, where they are both building anticipation and measuring the response to a MacBook Air 3G (or MacBook Pro 3G for that matter) long before announcing any such device. I think the only problem with a MacBook Air 3G is that it would lead to yet another data plan. Imagine you already have an iPad 3G and an iPhone, you’re already paying for two different data plans. If you bought a MacBook Air 3G would you have to pay for yet another plan? That’s a bit silly isn’t it? Consumers clearly want an all-inclusive data plan that covers all their devices, but since these aren’t offered reasonably through carriers, users result to things like jailbreaking an iPhone to setup a wireless hotspot which can then be shared across their hardware. This isn’t Apple’s problem though, this is the cell carriers problem, and hopefully it’s one that gets resolved soon. This is blatantly stupid idea. I don’t think there is any punch to the idea of surfing the internet through 3G on a laptop just yet. There is much to be said about the unrestricted mobility it promises, but not so much about the speed, which is essential. Some kind of wide-area data connection for laptops/netbooks is a fine idea. But the idea that existing 3G (and even near-term 4G) will be able to cut the mustard is absurd. AT&T has been a disaster in every way, both in therms of cost & customer service, and in the even more important realm of service that WORKS. Verizon won’t be able to do it, either, in the relevant timeframe for a 2011 release. About time; considering these things are supposed to be ultraportable and nearly all the HP laptops here at work have it. Clone a simcard I guess for the data side? But yeah, definite hurdle. I’m about to buy my first mac, and I’ve decided it to be the air, but I would certainly wait if I could get portable internet!